That’s Wildstar summed up. Only instead of fire, it’s neon boxes! Yay, progress!! Before I get into this review, let me say that I stumbled into Global Agenda. I had heard of it in a vague sort of way but it was never on my radar in any shape or form. Last week I was looking through You Tube for some WAR PvP videos and I noticed that one of guys who made some excellent Warrior Priest videos had moved over to Global Agenda. The videos he was making for GA were equally impressive and I decided, on a whim, to give it a try. The rest of this post details my thoughts on Global Agenda. Enjoy. I have a confession to make. It is something that I am somewhat ashamed of but something I am a bit proud of as well. Yeah, thats right, I liked Tabula Rasa. Strange, I know, but it was a fun game with tons of potential. Unfortunately, that potential was never even close to being realized. It was shut down quickly but, despite that, there was the foundation of an excellent game there. 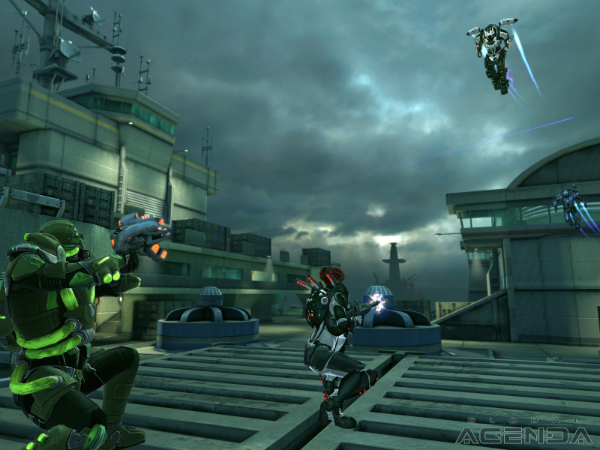 The combat was an intriguing combination of action shooter and MMO. The graphics were good and the story was interesting. I was sad to see it go. Why am I bringing up Tabula Rasa in a Global Agenda review? Because Global Agenda has a lot of Tabula Rasa in it. 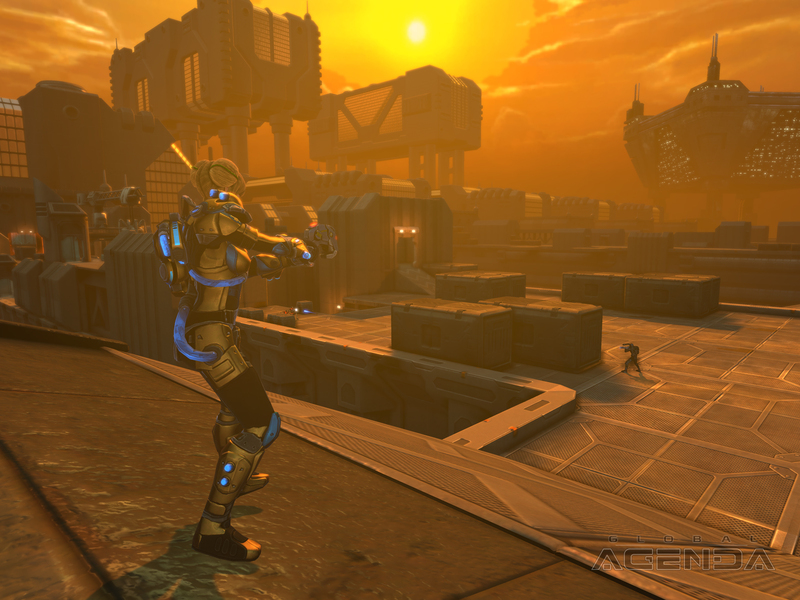 The combat is similar, the weapons are similar and I can feel Tabula Rasa’s influence when I play Global Agenda. Like Tabula Rasa, Global Agenda has a lot of potential. A metric ton of potential, in fact. Will it ever realize that potential? I don’t know but it is on the right track. Let’s take a look at the game and see if Hi-Rez studios has improved upon the ideas present in Tabula Rasa or if it is destined for the same failure that TR was. Character creation starts with the class decision. 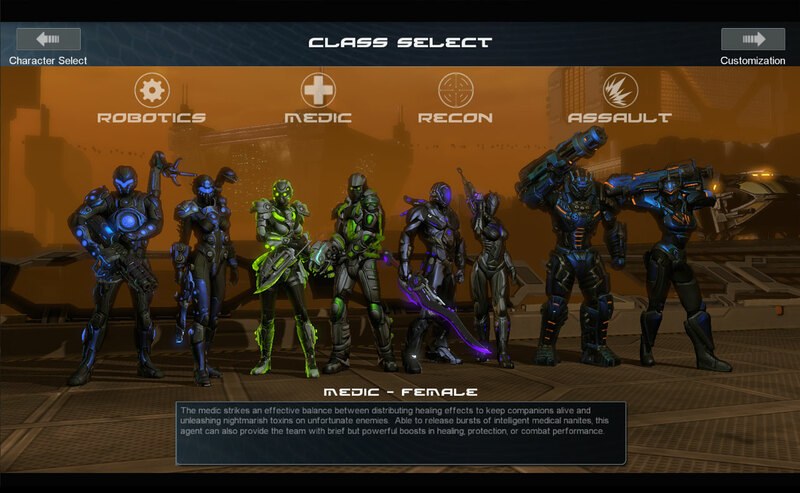 There are currently four classes to choose from; Assault, Medic, Recon and Robotics. Each brings a different skill set into the game and will appeal to widely varying play-styles. Here are some thoughts on each class. The Assault class is meant to be the ‘tank’ class of the game. They are equipped with bulky power armor and spend much of their time toting around a mini-gun like the one used in Predator to mow down trees. Because of this firepower, they are a hugely popular class and they are very, very good at what they are designed for. They can soak up the damage like no other and, if specced into defense, are nigh impossible to bring down. Their offensive capabilities are nothing to sneeze at either. The mini-gun puts out a high volume of fire and includes a slight knockback when hitting enemy characters. Additionally, they can carry various types of rocket launchers and defensive shields. They are a complete class. Spec-wise, they have many options to go with, from defensive heavy, to offensive juggernauts. All three spec trees are viable, from what I have gathered, and all three are fun. One of my friends chose the Assault class and, despite hating to play tanks in other MMOs, has specced defensively and he loves it. The Medic, as the name suggests, is the primary healer in Global Agenda and, as with most MMO healers, is probably the least played class in the game. This can not be attributed to the Medic’s effectiveness, they are a very good class, but to the lack of people who like to play healers. 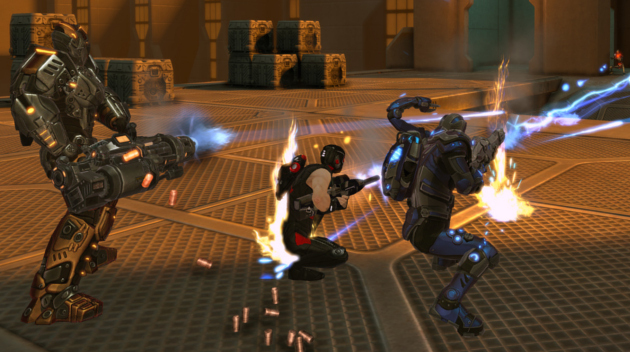 Unlike healing in most MMOs, the Medic must aim his heals at the intended target, which adds some difficulty to the process. 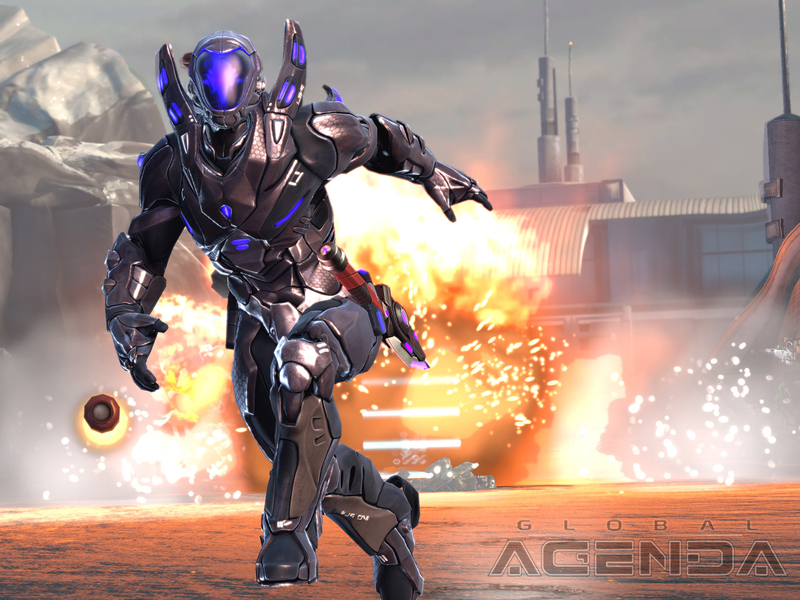 They are equipped with AoE healing “grenades” but their main healing is aimed. In addition, they have decent DPS in the form of poison attacks. These attacks consist of grenades, DoTs and melee ‘injections’. All of this makes for a pretty potent class and I found them a fun and challenging class in my limited time playing one. Aaaah, the class I love to hate. I detest Recons, not because they are not a good class, to the contrary they are a very, very good class. I hate them because they are the antithesis of my chosen class, the Robotic. Recon can be very effective, depending on spec, in melee or extreme long range. They have a myriad of tools to bring the pain; samurai-looking power swords for up close, sniper rifles from ranged and an assortment of bombs, mines and stealth orbs to get in close and do damage. They excel at destroying Robotic’s turrets and medical stations and are deadly with a sniper rifle. The class takes a lot of skill to play properly. Good aiming skills are a must when using the sniper rifle and circle-strafing is a necessity when meleeing. Don’t choose this class expecting to be pro at it immediately. Really good Recon players really separate themselves from the pack. Robotics is the hybrid class of Global Agenda. Able to DPS, off-heal and even do limited tanking, they are very versatile and allow players a wide range of playstyles. The class bears a superficial resemblance to the Engineer in Warhammer Online but is a lot more effective than the Engineer. Robotics are masters at digging in on the defensive. With the ability to drop turrets that do massive damage, they can really make it difficult to take an objective in PvP. In addition, they can use drones when going on the offensive that do very good damage and can be used to take out opposing Robotic’s turrets. Finally, they have medical stations they can drop for off-healing and force fields that can be used to block incoming damage. Robotics are Engineers done correctly. Mythic/Bioware would do good to give Global Agenda a spin and see how to bring some of the Robotic’s effectiveness over to the Engineer. Character creation is pretty standard. Pick a class and then customize their facial features. Global Agenda has a pretty robust facial editor but it really does not matter. You will quickly obtain power armor that will cover up that pretty mug of yours and no one will ever see the beautiful face you have created. One interesting thing about character creation is the naming system. You only have on name for all of your characters, so choose wisely. If you name your first character foolishly every other character will have that same exact name. After creation you are loaded into a cutscene that tells a little of the back story of the world and introduces your character. The cutscene is well done and is as exciting as initial cutscenes can be. Fortunately, you have the ability to skip the entire tutorial after the first go-around. The tutorial itself is fairly standard. It introduces you to your first weapons, your jetpack and the interface. It is a quick and dirty introduction and soon dumps you into the game world proper with the begininning of a quest chain and some starter weapons. From the tutorial you are placed in a hub of sorts called The Dome. This is the main (and only) city in the game. From here you can queue for PvE or PvP missions, visit the Auction House, test equipment in a virtual reality arena, working on crafting and get your hair cut. For the most part, this is a large virtual lobby from which you queue for missions. I believe that the original idea for Global Agenda was for everything to be spawned from here and not have any ‘persistent/open’ world at all. From player feedback, Hi-Rez has decided to move away from that idea and start including more open world features. From that, Sonoran Desert is spawned. The Sonoran Desert is a large open-world PvE zone, not unlike a typical WoW PvE zone. Clusters of quests and adventure areas are dispersed across the zone and slowly ramp up in difficulty. The Desert is fairly large and looks nice. 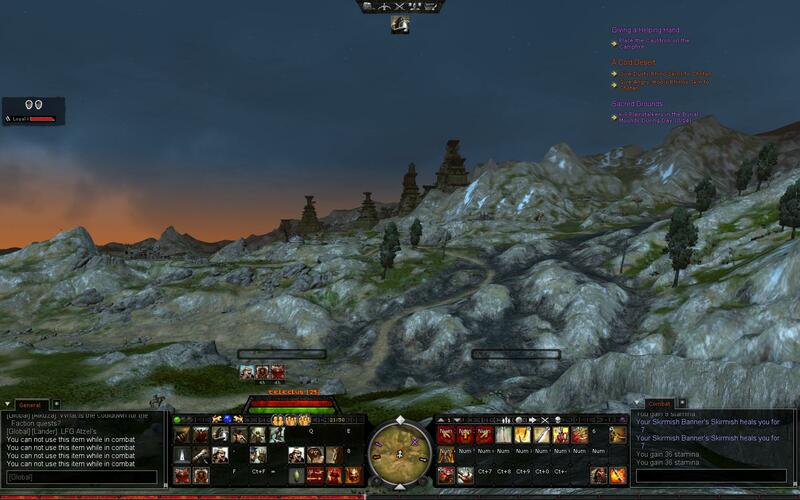 The layout is typical of standard PvE questing zones and most will feel right at home out here. The quests range from typical kill quests to more involved quests and also range from extremely easy to nigh on impossible without a group. For a first foray into an open zone, Hi-Rez has done pretty good here. I enjoyed the quests and the zone, while large, was not too large to traverse with my jetpack. The graphics are nice and you often see sandstorms kicking up around you and the wind howling through. From what I have seen with Sonoran Desert I am very interested to see where Hi-Rez can take us in the future. Before I go any further with review, I want to talk graphics. In many ways, Global Agenda reminds me of Aion with what they have been able to accomplish with the Global Agenda engine. The art style of the two could not be further apart but both accomplish a lot with very little. Aion has always looked beautiful, despite not having the most advanced graphic engine from a technology stand point. Global Agenda is the same way. It looks great and runs flawlessly. The armor is detailed and imposing when it wants to be. The laser effects are awesome and the rocket launcher just exudes cool with its effects. A heavy fire fight is just a joy to behold and looks right out of a movie at times. All of this comes at a very low price, the engine runs flawlessly for me, even under a heavy load. I have been in the middle of large fire fights, with turrets blasting away, force fields sprouting up and the Assault class mowing things down with their mini0gun and kept a constant 60+ FPS. That is pretty impressive in my mind. PvE missions can be queued up from level five and are broken up into brackets depending on your level. The first missions are quite simple and involve only one boss. As you get higher you will see increasingly more complex missions and they get quite hard. They do remind me of standard MMO instances in many ways but the addition of FPS-style combat and ranged tanking make the familiarity passing at most. The combat certainly changes everything in PvE. It is very reminiscent of Tabula Rasa and enemies can and will use supressing fire, flank you and retreat if needed. I think the A.I. is a small cut above the standard A.I. found in MMOs. The boss fights can be as complex as many WoW PvE boss fights, as each boss has its own special abilities. 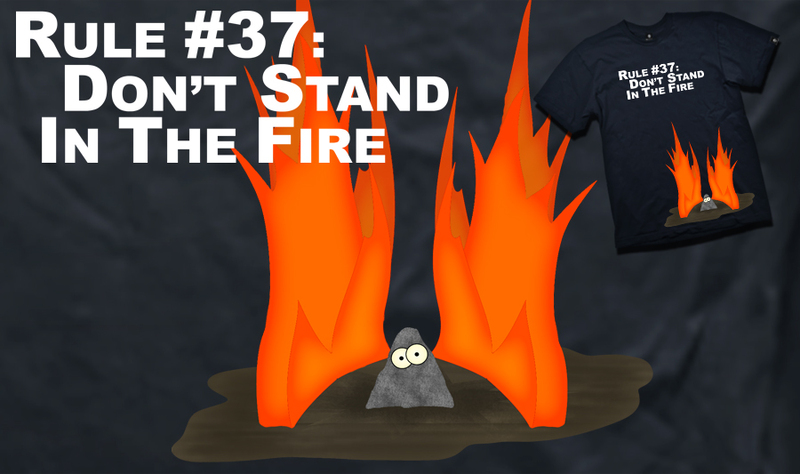 Charges, knockbacks, AoE fire attacks, adds and the like all make their appearance. I want to stress, however, that even though the bosses have similar abilities to your typical WoW boss, the mob A.I. and the 3rd person shooter style combat brings the encounters to an entirely different realm. I have really enjoyed all the missions have partaken in thus far. There are a few different types of PvP in Global Agenda but, thus far, I have only partaken in Mercenary PvP. 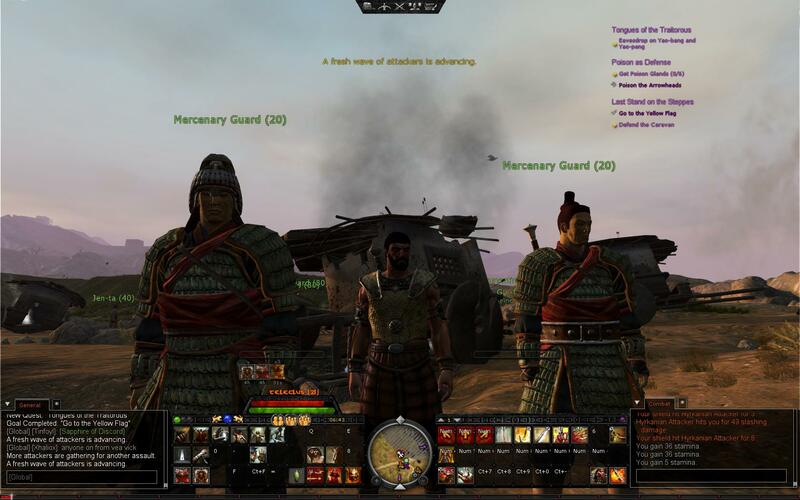 Mercenary PvP is a lot like WoW battlegrounds or a typical Counter-Strike map. Two teams, different objectives depending on map and away we go. That said, the PvP is fast, frantic and, most importantly, fun. Even better, I have rarely been in fights that did not go the distance. Almost every fight I have been in has been a fight to the finish, no team has run away with it. These are very competitive PvP matches. I think that is helped by the fact that, at least in Mercenary mode, you can only queue yourself and one other up. No premades running rampant and destroying everything. The PvP also seems very, very well balanced. Every class has their place and every class is needed. Assault to capture objectives, medics to heal, robotics to defend and recons to supply high DPS and destroy turrets and implacements. Every class is capable of winning the match and being the hero, if played properly. I stumbled onto Global Agenda and I am very glad I did. It is tremendously fun and there is a whole lot of potential here. I do hope to see more persistent zones (both PvE and PvP), endgame raids and a DAoC-style PvP endgame at some point but even without those it is tremendously fun. The combat is a refreshing change of pace as is the sci-fi setting. Even better, the game has no monthly sub and can be picked up for only 29 bucks on Steam. That is a great deal. I hope that Hi-Rez can make Global Agenda a success. I really do not want to see it go the way of Tabula Rasa, there is simply too much potential here and a lot of fun to be had. By the way, I am finishing up my first poor attempt at a PvP video tonight and should have it posted tomorrow, along with a more detailed description of PvP in general and Robotics PvP in particular! I had the day off from work today and it turned into one of the most fun and productive days I have had in AoC. I started off around level 22 on my conqueror and was finishing up some quests in Old Tarantia before heading off to the next zone. I ended up at level 30, having completed scores of quests in the Gateway to Khitai zone. Not only did I gain eight levels but I had tremendous fun doing it. 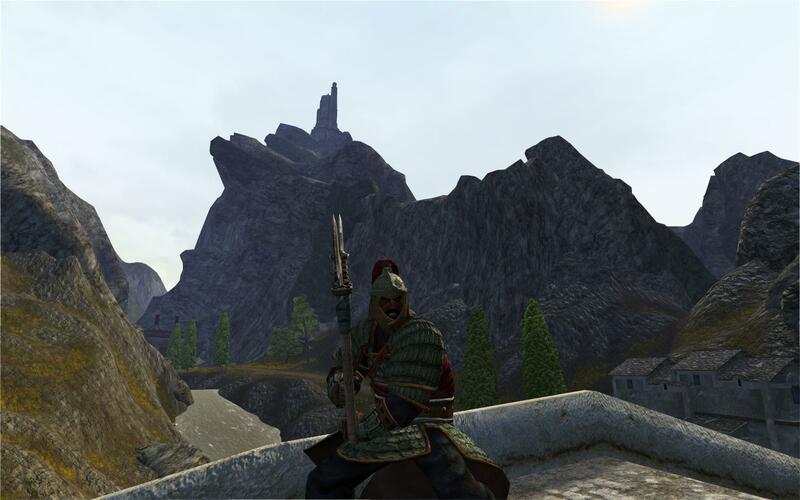 Getting from Old Tarantia to the Gateway of Khitai requires a bit of travel and sight-seeing. From the docks of Old Tarantia, one mus take a ship to Khemi, the capital city of Stygia and from there a ship to Khitai. The ship to Khitai requires either expenditure of coin or a promise to help protect the ship and caravan on the journey. Being short on coin, I signed up to protect the caravan. Hey, free passage is free passage, right? Of course, along the way we find ourselves in a canyon area, which is the perfect place for an ambush. I was enlisted by the Caravan leader to earn my keep and scout the canyon before the caravan proceeded. Inevitably, I found myself pinned down by archers in the canyon and had to scale the canyon walls to kill each one in turn. After succeeding in defeating the would-be brigands, I returned to the caravan and we completed the journey. The first steps in Khitai are the perfect example of just how brutal the Conan world can be. 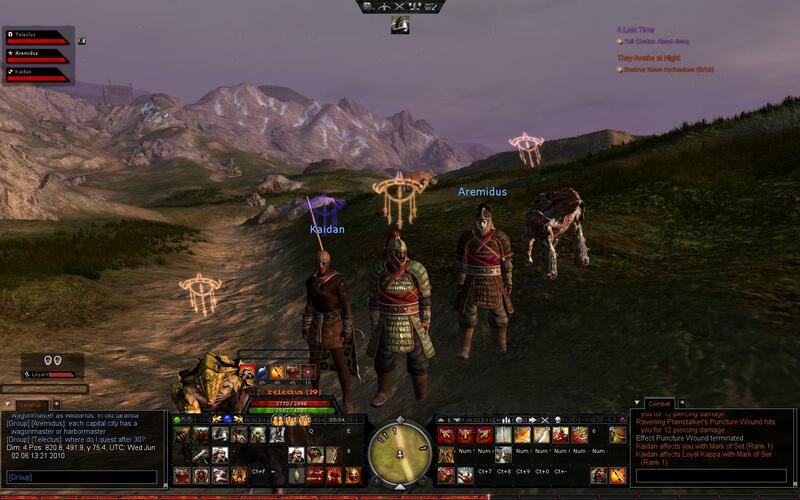 The first quest area is an ambushed trading caravan pinned down by enemy forces. 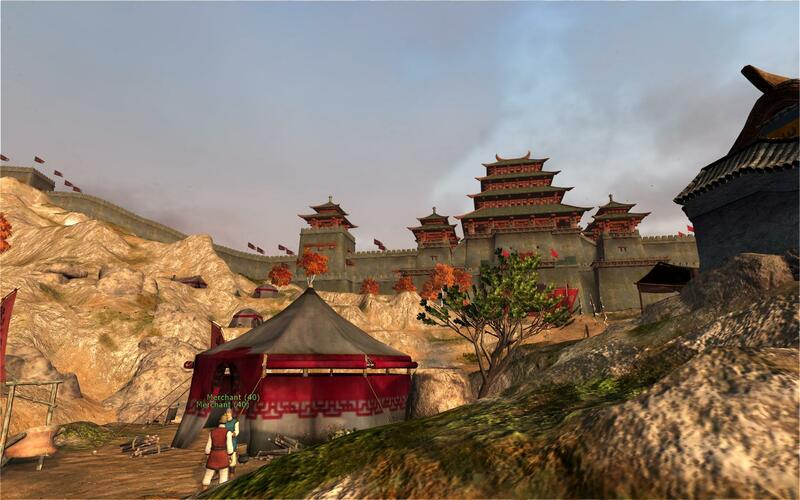 Your initial quests are from this caravan, as you fight off waves of attackers, find supplies for the sieged caravan or trek to the Great Wall to ask for assistance. The quests are nothing extraordinary and are along the same lines of any other quest-based MMO but the story, the atmosphere and, of course, the graphics set AoC apart from other MMOs. This is a barbaric world, filled with dead bodies, half-eaten corpses and vile death all around. It is 100% Conan. After helping out the caravan, I made my way to a small village surrounded by enemies. This is the next quest hub and sends you on various quests to help the village residents. It was here that I was treated to my first gank in Khitai. Matter of fact, the entire evening was a solid mix of PvE and PvP. I intend to post more in-depth about my PvP adventures later this evening or tomorrow, so let me get back to the remainder of the evening. I quested for a couple of hours solo which got me to level 24 or so. About this time I was invited to a group by a Priest of Mitra. Figuring a Conqueror and PoM (healing class) was a good combination, I took him up on his offer. I am glad I did. For the next six hours we made our way across the zone, finishing quest after quest. From killing undead Samurai to killing Yak and feeding their meat to a dog, we did everything. And we had tons of fun doing it. At the end of the night I joined his guild. The guild is very small and brand new, they do not even have a city yet, but I figure it will be fun to help grow a small guild and see one built up from scratch. I look forward to seeing a guild city built and the guild grow into a raiding guild. It has been awhile since I have been a part of that growth process and I miss it. We picked up another healer along the way, a Tempest of Set, that I uncouthly killed after mistaking him for a player who had attacked us earlier. I rezzed him (yes, a tank class with a rez AND a battle rez!) and he joined us for the rest of the evening. By the time I logged off I had reached level 30 and completed the first set of Khitain gear. This gear has a totally different look than the other gear in the game and keeps with the Asian feel of the expansion. I look positively samurai-like at the moment, which is a nice change of pace from other MMOs. We also set up a time tomorrow night to venture into the first six-man instance in AoC, the Black Castle. With two healers and a tank, we should not have a problem finding three more folks to head into the castle with us. I am extremely excited to experience my first “dungeon” in AoC and I will be writing about it more tomorrow night. I am going to leave you with a few more pictures from my initial taste of Khitai. I hope you enjoy them! The zone is huge and, yes, you can get to the towers back there! The Samurai look I ended the night with.